In this, a golden era of the motorcar, if there was only one vintage auto that The Professor could fix-up, it would not likely be any of the typical choices. The Professor would say “no,” for example, to a late-1960s Mustang [even to an Eleanor, as driven by Nicholas Cage in Gone in 60 Seconds], even to a late-1950s ‘Vette [like the one driven by Robert Downey, Jr. in Less than Zero], and even to a convertible Charger [as driven by Don Johnson in the series Nash Bridges]. The Professor would still say” no” to a Ferrari, Lamborghini or a Bentley. Instead, he would choose the BMW 3.0CSi and he would restomod it. A restomod [restoration + modernization] is a build that utilizes all-modern upgrades to the key systems [mechanical and electric]; it takes advantage of the progress that has been made in both safety and performance features. The car looks the same from the outside even as it’s vastly improved on the inside. By contrast, a restoration is about purity; it uses original factory parts to restore the car to its historic specs and it aims to get it to the condition it was in when it left the showroom. The restomod makes a better driver; the restoration a better garage queen. The 3.0CSi shown above was a restoration but it is still inspirational to The Professor. In fact, it was among the first ground-up restorations performed by BMW’s Classics Center in Munich; it was chosen, I believe, because BMW believes [correctly] that the 3.0CSi is an icon. Produced between 1971 – 1975, the 3.0CSi [3 liter] coupe known internally as the E9 was produced in quite limited numbers: about 8000 total worldwide over those five years. For The Professor, the 3.0CSi embodies the design fundamentals. Great proportions. Dynamic asymmetry. Assertive yet elegant stance; a nice forward lean. Focal point logically placed where the driver sits. Great negative-space-to-positive-space ratio. Big windows all-around, especially at the rear; minimal B-pillar. The C-pillar with the blue-and-white roundel logo and with the famed Hofmeister kink [named after then-BMW design chief Wilhelm Hofmeister] sits at the bottom of the side-rear window [a signature on all BMWs until recently, as on the i-3]. Great visibility for the driver due to the high and open greenhouse, even the right minimal tint to the glass. Coherent alignment of the car’s constituent elements; juxtapositions of form and material are part of a larger system of relationships that interact to form a whole, to achieve visual unity in the vehicle’s overall appearance. Color-wise, The Professor is partial to the chamonix-white [as shown] due to it being optimal for highlighting the timeless form and subtle details of the car. The Professor acknowledges that the white color would also show any flaws, dings and the like. Truth be told, however, The Professor wouldn’t care if the body had dings, flaws or surface issues—just not too much rust [although the fabricator of the 3.0CSi was Karmann and they seem to be known in that time period, unfortunately, for fostering oxidation rather than suppressing it]. The original 3.0CSi had the inline 6-cylinder engine that would come to define the marque’s driving persona: happy being revved, dialed-in handling, torquey response and even a bit rorty when pressed. With Bosch’s D-Jet injection, it topped out at 200bhp according to BMW charts. Imagine what it would be capable of with an upgraded transmission/drive system, say from a late 1990s E36 or a mid-2000s E46 M3 BMW. Add new brakes, take advantage of ABS, new exhaust, at least 3-point seat belts, new rims and tires. And if The Professor had his way, cloth seats and upholstery instead of the standard leather. Here’s what we have now: the grace and refinement inherent in the 3.0’s sheet metal design and the sturm und drang potential from the performance changes; and don’t you know the restomod 3.0CSi could quell any hoons waiting to show off at the stoplight or freeway on-ramp. Produced at the same time as the BMW 3.0CSi model was another of The Professor’s favorite cars: the 1970 – 1976 2002, especially in the more hopped-up tii version. Both cars got it right, design-wise. Although the 3.0CSi was the more elite and elegant solution, the 2002tii shared many of the same attributes; both drew on the same overall design language. For example, the slender C-pillar seen on the 3.0 was also highlighted on the 2002, allowing optimal rear-view sighting through the side and rear-window glass. Same big greenhouse, same rear-side Hofmeister Kink as well. And both cars featured a simplified front grill. Two vertical looped shapes at the center—what BMW calls “kidneys”—that were then elongated and pushed together. Horizontal grillwork then ran to headlights on either side [one headlight on each side of the 2002, two on each side of the 3.0]. Result: Those details helped make the car a a performance winner and a commercial success, especially in the United States, but the true design secret of those two cars is that they did more with less—and that’s why they are legendary, and that’s why they call me The Professor. n.b., You don’t see BMW 3.0CSi’s or 2002 tii’s at most of the big car auctions. Mecum’s, which has auctions around the United States every few months, is famous for its American muscle cars. 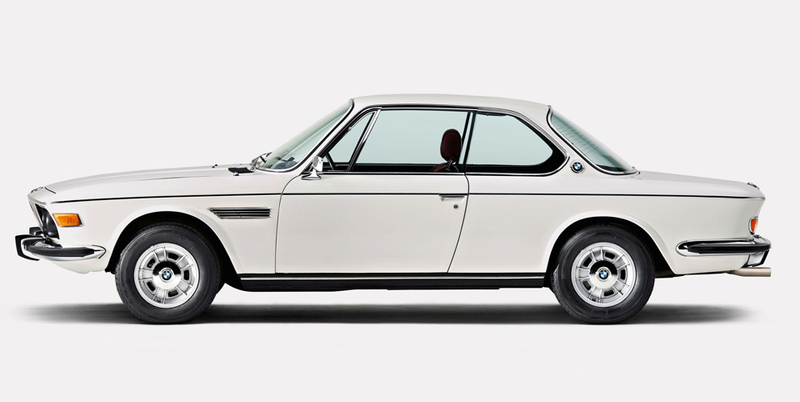 You’ll still see Mercedes and Porsches on sale there, but the vintage BMWs are few and far-between. At the same time, the price for a high quality 3.0 CSi seems to have doubled in the last 18 months, from $30-$49K to $50-100K. Although they may not qualify as a “value investment,” the prices for these two cars are still going up in value, and The Professor believes that they will only continue to elevate.